Does your business have cleaners, solvents, pesticides or other chemicals that require disposal? 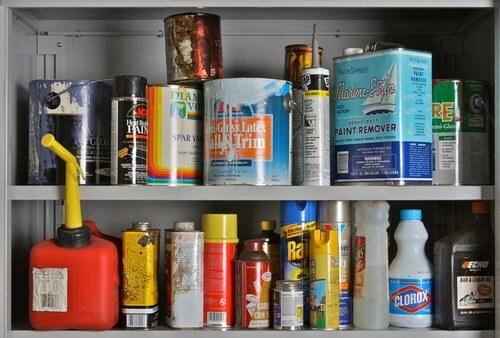 Dispose of your hazardous household waste safely, in a manner that won't harm the environment. You must call to make an appointment at 715-446-3101 x100 to drop off hazardous items. Please call at least one day in advance. Don't see your product on the list? Call the Solid Waste & Recycling Information Line 877-270-3989. Protect groundwater and the environment. Get hazardous substances out of the house, away from children and pets. Make your community a better place to live. The following items are collected as part of the Marathon HHM Collection program at no charge to residents in Marathon or Shawano Counties. Lincoln County residents may also bring in items but must pay full disposal costs; they can later get reimbursed by Lincoln County Solid Waste Department for up to $75. If items are usable they may be added to our Choose to ReUse area. Next time you need just a small amount of something check out this area for yourself. We just might have what you are looking for. *If you have less than 5 gallons of these items, you do not need to make an appointment. These small amounts can be brought anytime during our open hours. Sharps are accepted at the Marathon County Solid Waste Department. Put them in a commercial sharps disposal container or in a heavy plastic detergent or bleach bottle with a screw-on cap for sealing tightly. No milk jugs or other thin plastic. Do not separate the needle from the syringe. Label the container with “biohazard,” “infectious waste,” or “sharps." Who is a VSQG? VSQGs are businesses, units of government, schools, non-profit groups & organizations that generate less than 220 lbs./month & accumulate less than 2,200 lbs of hazardous materials at any one time. Those with an EPA ID# or who generate larger amounts of hazardous materials do not qualify as VSQGs and must arrange regular pick-up services for these materials. Why? Hazardous materials generated by businesses or agencies must legally be disposed of in a safe and proper manner. Disposing of small amounts of hazardous material is often difficult and expensive for a single group or business. Being a part of our VSQG program could save you the $400-$600 mobilization fee, as well as other fees, charged by a hazardous waste disposal company. You also get great rates by being part of a collection program that includes households. Complete and send in the VSQG Chemical Inventory/Program Registration form. Contact the Marathon County Solid Waste Department 715-446-3101 Extension 100 for estimates or with questions. This service is available to Marathon County, Shawano & Lincoln county businesses. We provide service to Wood County residents, agricultural operations, and businesses. You must pre-register to participate. Click here for VSQG Chemical Inventory/Program Registration form.